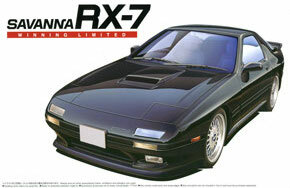 You can use the Kit finder page to search for RX-7 model kits at several online mailorder shops. 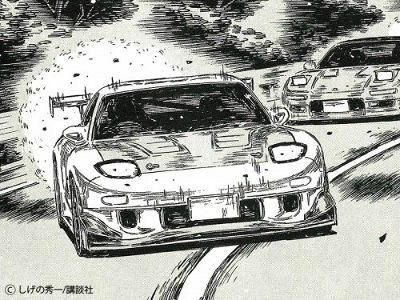 Aoshima announced a kit of the earliest version of the RX-7 FD3S as featured in the Initial-D manga. 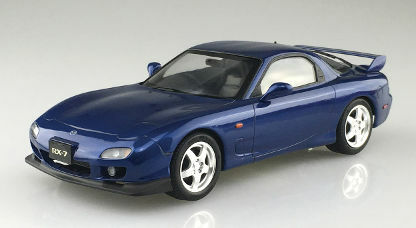 The kit will be the first 1/24 scale RX-7 FD kit to feature optional popped-up head lights. The kit has been scheduled for release in June ("Takahashi Keisuke FD3S RX-7 Comics Vol.1 Ver. ", 'Initial-D' series Nr.12, cat nr.056219, price 3000 yen). More info at Aoshima website. 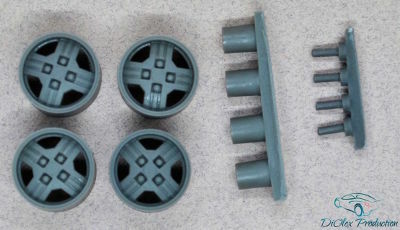 I just found vendor 'DiOlex Production' selling several different sets of resin 1/24 scale Mazda wheels on eBay, so I added these to the 'RX-7 Wheels' page. Hasegawa just released this Japan-only limited edition of their Mazda Cosmo Sport L10B kit, which comes with a diorama backdrop and a pair of anime figures printed on clear acrylic. ("'Zessyaka!' Mazda Cosmo Sport L10B", cat nr.SP389, price 3800 yen). Aoshima announced a kit of the wide body RX-7 FD3S as featured in the Initial-D manga. The kit will feature a new 'full aero-spec' body and include a full roll-cage. The kit has been scheduled for release this December ("Takahashi Keisuke FD3S RX-7 Project D Ver. ", 'Initial-D' series Nr.8, cat nr.056202, price 3000 yen). 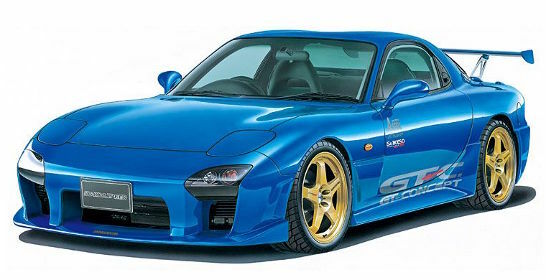 The limited edition Aoshima '99 RX-7 FD prepainted in 'Innocent Blue Mica' has been rescheduled for release this November ("Mazda FD3S RX-7 '99 (Innocent Blue Mica)", 'Pre Painted Model' series Nr.SP, cat nr.054987, price 4000 yen). 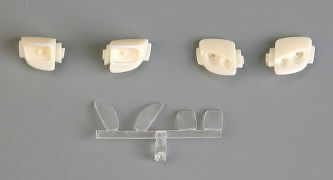 Hobby Design has announced a set of 1/24 scale resin parts for depicting the headlights of any RX-7 FD kit raised. In addition to the raised lights a set of 'sleek' flush mounted lights is also included. The set is scheduled for release this July ("1/24 Mazda RX-7 Front Lamp Detail-Up Set", cat nr.HD03-0519). 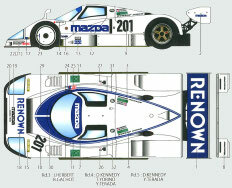 Shunko has released a set of decals for the missing 767B: the 1990 Le Mans entry ("Charge 767B 1990 Le Mans", cat nr.SHK-D350, price 1800 yen). 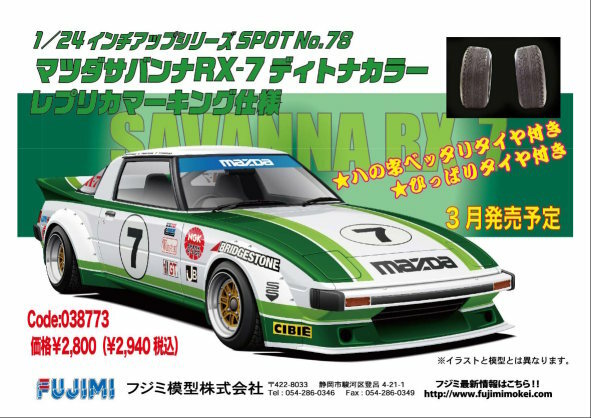 Tamiya has a rerelease of the RX-7 FC GT-Limited kit scheduled for late June ("Mazda Savanna RX-7 GT Limited", 'Sports Car' Series Nr.60, cat nr.24060, price 2300 yen). Hasegawa announced a rerelease of the limited edition PlaySure Racing 767B scheduled for August ("PlaySure Racing Mazda 767B", cat nr.20359, price 3000 yen). 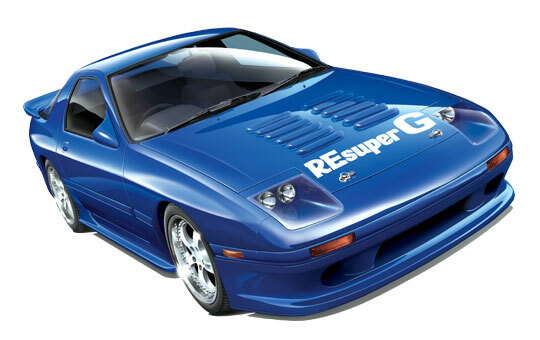 Aoshima plans to add a rerelease of the RE-Amemiya FC3S REsuperG Full Aero version to the 'The Tuned Car' series, it is scheduled for release this June ("RE Amemiya FC3S RX-7 '89", The Tuned Car' series Nr.58, cat nr.055809, price 2600 yen). At the recent 2018 Shizuoka Hobby Show, Hasegawa announced a limited release of the MAT Cosmo with added resin parts for a MAT bike and a figure of MAT female member Yuriko Hill. 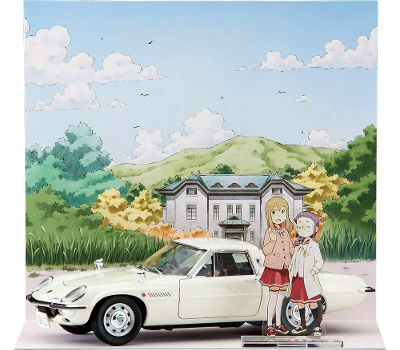 The kit is scheduled for release in June ("MAT Vehicle w/MAT Female Member", SP376, cat nr.52176, price 3800 yen). More info can be found on the Hasegawa website. 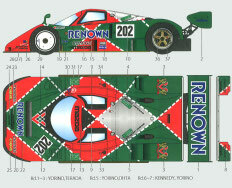 Aoshima has announced three new kits based on their '98 FD kit. The first one is a 2002 'Spirit R' Type B version that will be added to the 'The Model Car' series ("Mazda FD3S RX-7 Spirit R Type B '02", 'The Model Car' series Nr.77, cat nr.055861, price 2600 yen). The 'Spirit R' Type B differs from the Type A by having rear seats and regular front seats instead of red Recaro lightweight full bucket seats and by having its BBS wheels painted silver instead of metallic gray. The other two new FD kits are factory painted limited releases of the '98 FD kit, one in 'Vintage Red' ("Mazda FD3S RX-7 '99 (Vintage Red)", 'Pre Painted Model' series Nr.SP, cat nr.054970, price 4000 yen), the other in 'Innocent Blue Mica' ("Mazda FD3S RX-7 '99 (Innocent Blue Mica)", 'Pre Painted Model' series Nr.SP, cat nr.054987, price 4000 yen). All three models are scheduled for release in May, the model names are linked to info at the Aoshima website. Aoshima plans to add a kit of the face-lifted '89 FC3S RX-7 to the 'The Model Car' series, it is scheduled for release in March 2018 ("Mazda FC3S Savannah RX-7 '89", 'The Model Car' series Nr.64, cat nr.055496, price 2600 yen). Hasegawa is about to do limited releases of two more versions of the Mazda Cosmo Sport L10B and of the Finish Line version of the 767B kit. The regular Cosmo Sports L10B is scheduled for rerelease in late November ("Mazda Cosmo Sports L10B", cat nr.21202, price 2500 yen), the MAT Vehicle (Cosmo Sports L10B) is scheduled for late December ("MAT Vehicle", cat nr.CQ1, price 2200 yen) and the Finish Line Mazda 767B is scheduled for a rerelease in January 2018 ("Finish Line Mazda 767B", cat nr.20325, price 2800 yen). More info on Cosmo Sport L10B, MAT Vehicle and Finish Line 767B kits at the Hasegawa website. 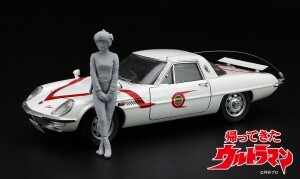 Hasegawa celebrates the 50th anniversary of the Mazda Cosmo Sport with a limited edition which includes a resin female figure in 60ies clothing. The release is scheduled for December 2017 ("Mazda Cosmo Sport L10B w/Girl Figure", SP368, cat nr.52168, price 3800 yen). The Aoshima BN Sports FC3S RX-7 '89 is about to be added to the 'The Tuned Car' series, it is scheduled for release this October ("BN Sports FC3S RX-7 '89", The Tuned Car' series Nr.40, cat nr.054499, price 2600 yen). 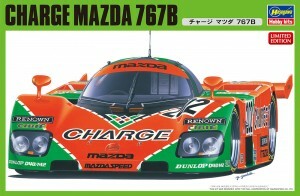 The Hasegawa Charge Mazda 767B is scheduled for a rerelease this September ("Charge Mazda 767B", cat nr.20312, price 2800 yen). More info at Hasegawa website. The Aoshima Mazdaspeed FD3S RX-7 GT-Concept '99 is about to be added to the 'The Tuned Car' series, it looks like the kit is unchanged from previous releases, it is scheduled for release late June ("Mazdaspeed FD3S RX-7 A-Spec GT-C '99", The Tuned Car' series Nr.27, cat nr.053584, price 2800 yen). Revell USA has announced a rerelease of the former Monogram Rx-7 kit. This rerelease contains all parts for the street version and also all parts for the former Monogram Rx-7 CAFE racer kit plus all-new decals for both versions. The USA release of this kit is scheduled for April. ("Mazda RX-7 2 'n 1", cat nr.85-4429, price US$24.95). The Vertex FD3S RX-7 '99 will be added to the 'The Tuned Car' series, it looks like the kit is unchanged from the previous release, it is scheduled for release in October ("Vertex FD3S RX-7 '99", The Tuned Car' series Nr.9, cat nr.052396, price 2800 yen). A fresh run of the Veilside FD3S RX-7 Combat Model kit will be released in November ("Veilside FD3S RX-7 Combat Model", 'S Package Ver.R' series Nr.88, cat nr.007228, price 2400 yen). The FC3S Savanna RX-7 Late Type `89 will also be rereleased in November ("FC3S Savanna RX-7 Late Type `89", 'The Best Car GT' series Nr.71, cat nr.046609, price 2200 yen). 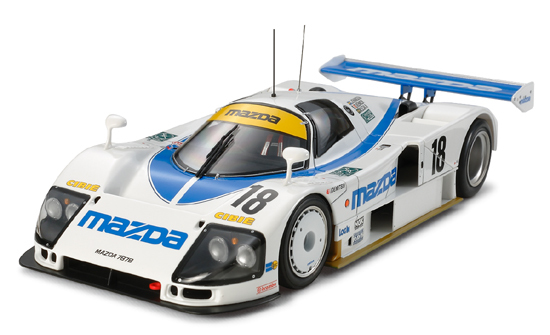 To conclude, the Mazda SA22C RX-7 Daytona `79 race car will be rereleased in November, this time in the 'The Model Car' series ("Mazda SA22C RX-7 Daytona `79", 'The Model Car' series Nr.22, cat nr.052297, price 2200 yen). 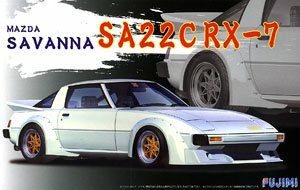 Fujimi recently did a rerelease of their trusty old Rx-7 SA ("Mazda Savanna SA22C RX-7", 'Inch Up Disk' series Nr.80, cat nr.039541, price 1900 yen). This month ARII/MicroAce did a new run of the nice former LS kit (" '79 Savanna RX-7", 'Owners Club 24' series Nr.07, cat nr.205075, price 1800 yen). 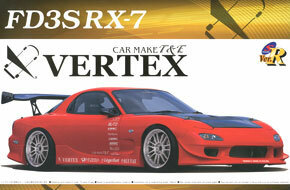 Aoshima has announced a rerelease of the recent RX-7 FD type IV kit, the release is scheduled for June. 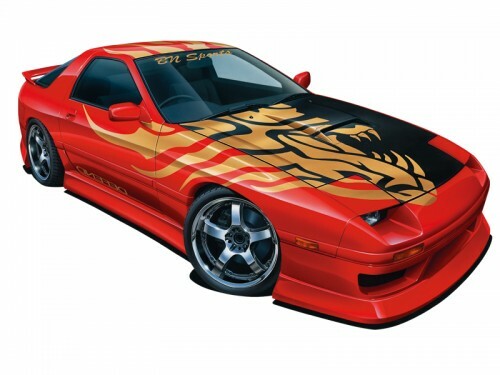 The kit will now be part of the 'Model Car' series and will feature new decals ("Mazda FD3S RX-7 `96", 'Model Car' series Nr.7, cat nr.051580, price 2600 yen). Some more info can be found on the Aoshima website: RX-7 FD 1996 (type IV). Hasegawa will do a rerelease of the Mazda Cosmo Sport L10B 'Marathon de la Route' race car, scheduled for release in May ("Mazda Cosmo Sport L10B, Marathon de la Route", 'Historic Racers' series Nr.HR-03, cat nr.20274, price 3400 yen). Aoshima has two new RX-7 kits scheduled for release in December. 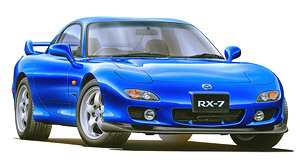 The first one is a Patrol Car version of the recent RX-7 FD 1996 (type IV) ("RX-7 FD 1996 (type IV) Patrol Car", 'The Best Car GT' series Nr.60, cat nr.014165, price 2800 yen). The second one is another version of the FC3S that stars in the Initial-D manga, this time a late version fitted with large raised rear wing and a roll bar ("Ryosuke Takahashi FC3S RX-7 Hakone Battle Version", 'Initial-D' series Nr.7, cat nr.011560, price 2600 yen). Some more info can be found on the Aoshima website: RX-7 FD 1996 (type IV) Patrol Car and Ryosuke Takahashi FC3S RX-7 Hakone Battle Version. Hasegawa will do a rerelease of the Mazda Cosmo Sport L10B, schedulded for release in early September ("Mazda Cosmo Sport L10B", '' series Nr.HC-02, cat nr.21102, price 2500 yen). The Aoshima RX-7 FD 1996 (type IV) is available now. Aoshima has announced another new version of their RX-7 FD kit, this time the changes introduced for 1996 have been included. More info can be found on the new Aoshima website. The kit is scheduled for release in July ("FD3S RX-7 IV type", 'The Best Car GT' series Nr.90, cat nr.014158, price 2600 yen). The new Circuit Wolf version of the Fujimi Savanna GT/RX-3 is available now. 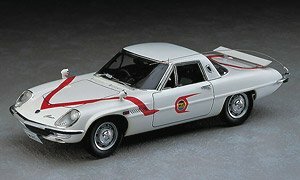 Fujimi is about to release a version of the Mazda Savanna RX-3 in the 'Circuit Wolf' series, the model looks like a variation on the Savanna GT Late Type Racing Version kit with new decals (i.e. 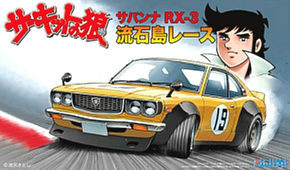 righthand drive only) ("Savanna RX-3 Sasuga Island Race", 'The Circuit Wolf' series Nr.CW-7, cat nr.17019, price 2800 yen). 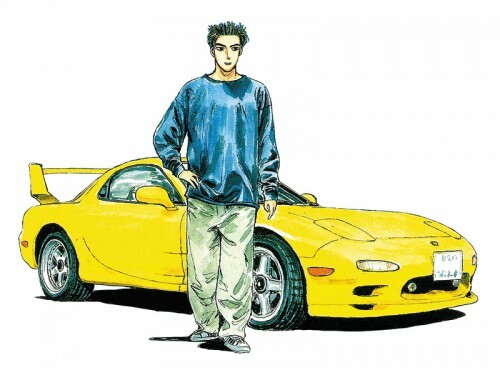 Fujimi is about to do rereleases of two versions of the RX-7 FD3S of Keisuke Takahashi ('Initial D'), both the early '96 FD3S (RX-7 FD3S, Keisuke Takahashi, 'Initial D' series Nr.10, cat nr.18329, price 2000 yen) and the Project D version with the Amemiya wide body (FD3S RX-7 Project D Version, 'Initial D' series Nr.21, cat nr.18359, price 2200 yen). Aoshima has the green Savanna RX-7 Daytona24 1979 racer scheduled for re-release in September ("Savanna RX-7 Daytona 24 Hours", Best Car Vintage series Nr.62, cat nr.047453, price 1800 yen). Finally Studio27 is about to do another run of their Mazda 787B photo-etched Upgrade set (Mazda 787B Grade Up Parts, cat nr.ST27-FP2413R, price 1200 yen). Fujimi recently announced a new version of their venerable RX-7 FD3S kit in the Inch Up Disc Series, it looks like a rerelease of the Enfini FD3S RX-7 Kai from the Initial D series. 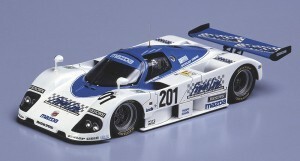 The kit is scheduled for release in March ("Mazda RX-7 Kai", Inch Up Disc series Nr.43, cat nr.038971, price 2200 yen). 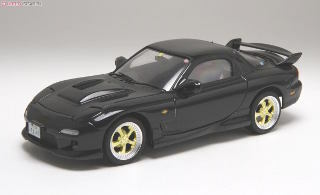 Another Aoshima rerelease coming up, this time the RE Amemiya Full Aero version of the RX-7 FC3S kit. The kit is scheduled for release in November (S Package Ver.R series Nr.49, cat nr.042540, price 2600 yen). The next Aoshima RX-7 kit scheduled for rerelease is the special edition of the RX-7 FD3S Bomex kit, this is the only Aoshima RX-7 FD kit available that includes lefthand drive parts. The kit is scheduled for release in September and is available now (S Package Ver.R series Nr.80, cat nr.005866, price 2400 yen). All of these rereleases are available now. Two more Aoshima kits are scheduled for rerelease in June: the RX-7 FD3S C-West (Aoshima 'FD3S RX-7 C-West' S Package Ver.R nr.70, cat nr.008102, price 2400 yen) and the 1991 Enfini RX-7 (Aoshima 'Enfini RX-7 1991' Best Car GT series Nr. 36, cat nr.05028, price 2000 yen). 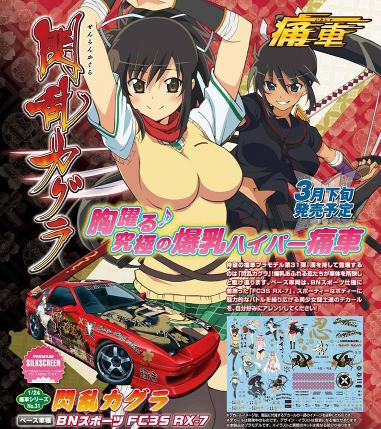 In the meantime the Itasha Senran Kagura BN Sports Savanna RX-7 FC3S has become available. Another Aoshima RX-7 kit is about to get the Itasha treatment, this time the RX-7 FC3S BN Sports will be released with a large sheet of decals picturing girls and graphics from the Senran Kagura manga (Aoshima 'Senran Kagura BN Sports FC3S RX-7' Itasha series Nr. 31, cat nr.007594, price 3800 yen). The rereleased VeilSide FD3S RX-7 is availble now. Aoshima continues doing rereleases of their RX-7 kits, for January the RX-7 FD VeilSide Combat kit is scheduled to be rereleased (Aoshima 'VeilSide FD3S RX-7 Combat' S Package Ver.R nr.88, cat nr.007228, price 2400 yen). 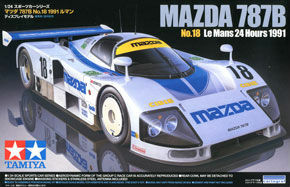 Studio 27 '1/24 Mazda 787 #56 Mazda LM 1991' ST27-TK2454, price 14000 yen). Studio 27 'Mazda 787B "Charge" #201 JSPC 1991' S27-DC961, price 1800 yen). 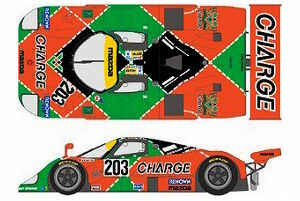 One more set of Studio 27 Mazda 787B decals will be released soon, this set will provide decals to turn the new Tamiya 787B kit into the 1991 Le Mans winning #55 (Studio 27 'Mazda 787B "Charge" #55 LM 1991' S27-DC959, price 2000 yen). For December Studio 27 has announced three conversion sets for converting a Tamiya Mazda 787B kit into a Mazda 787, each set will include decals for one version. More info can be found at the release schedule on the Studio 27 website. 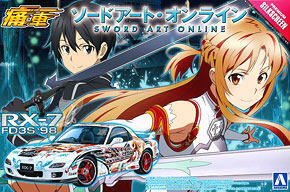 The new version of the Tamiya Mazda 787B and the Aoshima Sword Art Online FD3S RX-7 kit are available now. Another Itasha RX-7 FD by Aoshima, the kit will be based on the FD3S '98 kit and is scheduled for release in october (Aoshima 'Sword Art Online FD3S RX-7' Itasha nr.29, cat nr.006887, price 3800 yen). Tamiya has a new version of their 1/24 787B Le Mans racer kit announced, this time the kit will contain markings of the white-and-blue #18 car as it competed in the 1991 Le Mans race. 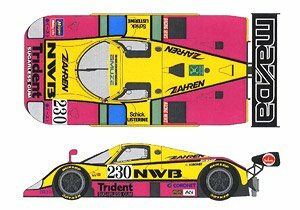 The kit is scheduled for release in late October (Tamiya 'Mazda 787B No.18 Le Mans 24 Hours 1991' Sports Car nr.326, cat nr.24326, price 2800 yen). Google translation of Tamiya Japan release announcement. In the meantime Fujimi did a rerelease of their venerable RX-7 FC Tohge kit, it is available now (Fujimi 'Mazda Savanna RX-7 FC3S' Tohge nr.9, cat nr.045986, price 1400 yen). Aoshima plans to do a rerelease of the Bomex Special Edition FD3S RX-7, the kit is scheduled for release in September (Aoshima 'FD3S RX-7 Limited Version' S Package Ver.R nr.80-SP, cat nr.005866, price 2400 yen). The limited edition Hasegawa Mazda Cosmo Sport L10B 'Police Car' and the Fujimi and Aoshima 'Initial D' rereleases are available now. 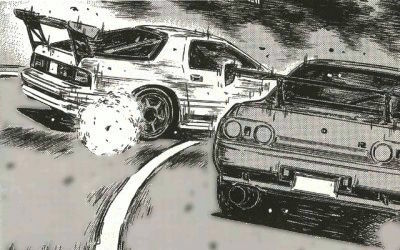 Fujimi plans to do a rerelease of a number of 'Initial D' car kits, including the Ryousuke Takahashi RX-7 FC3S, the Keisuke Takahashi RX-7 FD3S early version and the Keisuke Takahashi RX-7 FD3S A-Spec version. All 'Initial D' kits are scheduled for release at the end of July. Aoshima also plans to do a rerelease of their Ryosuke Takahashi FC3S RX-7 kit with engine parts, the kit is scheduled for release in July. In the meantime the Aoshima FC3S RX-7 Winning Limited kit has been released. 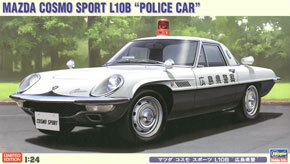 Hasegawa has a new limited edition Police Car version of their beautiful L10B Cosmo kit announced, scheduled for release in July (Hasegawa 'Mazda Cosmo Sport L10B Police Car', cat nr.20258, price 3200 yen). It looks like the announced rerelease of the Aoshima RE Amemiya FD3S RX-7 was cancelled. Aoshima has a rerelease scheduled of the Rx-7 SA 1979 Daytona Winner kit, scheduled for release in June (Aoshima 'Savanna RX-7 Daytona 24 hours 1979' The Best Car Vintage, 62, cat nr.047453, price 1800 yen). Studio27 has announced another rerelease of the Mazda 787B Grade-Up set, scheduled for release in June (Studio27 'Mazda 787B Grade Up Parts', cat nr. ST27-FP2413R, price 1200 yen). Aoshima has announced a new version of their RX-7 FC3S kit, this time it represents a special version that Mazda released in August 1991 to celebrate the Mazda victory in the Le Mans 24Hr race. This version is basically a 1991 RX-7 GT-R fitted with a lot of Inifiny parts, so expect the kit to look like the Aoshima FC3S Infinity 3 kit with a more luxurious interior. The kit is scheduled for release in late June (Aoshima 'FC3S Savanna RX-7 Winning Limited' Best Car GT, 70, cat nr.004227, price 2400 yen). Aoshima has announced a rerelease of the RE Amemiya FD3S RX-7 kit, scheduled for release in May (Aoshima 'RE Amemiya FD3S RX-7' S Package Ver.R, 96, cat nr.047965, price 2200 yen). The Fujimi Rx-7 SA racer in Daytona '79 livery is available now. Fujimi has a limited release planned of their Rx-7 SA racer in full 1979 Daytona winning livery. The insert picture of the slanted (high camber) profiled tires worries me a bit as the Daytona winner ran on slick tires with regular camber settings AFAIK. The release is scheduled for March 17th (Fujimi 'Mazda Savanna RX-7 SA22C Daytona racing color' Inch Up Disc series Spot release IUSP-78, cat nr.038773, price 2800 yen). The rerelease of the Aoshima FD3S RX-7 Vertex kit is available now and the revised box art now shows the real car fitted with the same RE30 wheels as contained in the kit.